After eating, remove your dentures and rinse them to remove any food particles or other debris. Always remove them over a folded towel or sink filled with water to prevent damage if you drop them. Also be sure to rinse your mouth after removing your dentures and brush your gums, tongue and any remaining teeth with a soft bristle brush. Scrub your dentures with a soft-bristled brush and a denture cleaner or mild soap. Regular toothpaste is too abrasive for most dentures, so be sure you’re using something mild enough to prevent damaging them. Also be sure to rinse them thoroughly before putting them back in your mouth to remove any chemical residue from the cleaning solution. You should be sure to brush the dentures at least daily to keep them in good shape. 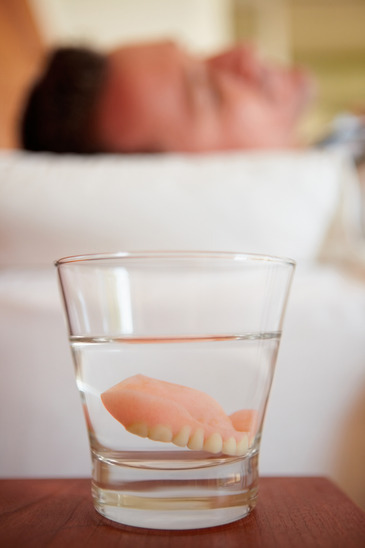 When not wearing your dentures, be sure to store them in liquid to keep them pliable. You can soak them in water overnight, or you can use a specific denture cleaning solution. Be sure that the liquid is not too warm, however, as hot water can cause the dentures to warp. Never attempt to adjust your dentures yourself. If they become warped or no longer fit properly, you’ll need to speak with your dentist about getting them repaired or re-fitted. Attempting to fix them yourself can cause damage to the dentures or even injuries to your mouth. Some dentures, such as those with metal fixtures, may have specialized care needs. It’s always best to consult with your dentist about proper denture care if you have any questions. This will help you prevent damage to your dentures and help them last a long time. If you have questions about your dentures or you think you may be a candidate for a full set or a partial set of dentures, call your dentist. If you are in the Bolivar area, feel free to call a Bolivar Family Dental team member at (417) 777-8654. We are also proud to serve the communities of Springfield, Buffalo, Halfway, Pleasant Hope, Stockton, Fair Play, Morrisville, Eldorado Springs and Wheatland. Click the Schedule An Appointment button above to book a check-up online.